Sometimes a new idea comes on like spontaneous combustion. Was it a marathon of Mad Men episodes? Or the aprons from my mom's house? 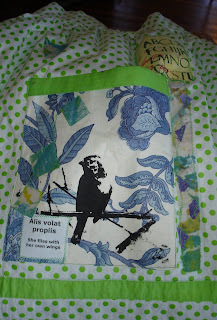 Or the pile of print scraps I started to use for fabric printing? Some how these combined to become Altered Aprons. 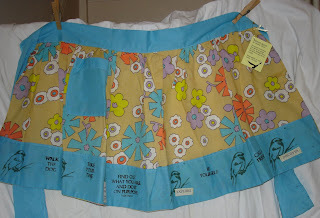 I start with beautiful vintage aprons: clean, hardly used, many hand-made. 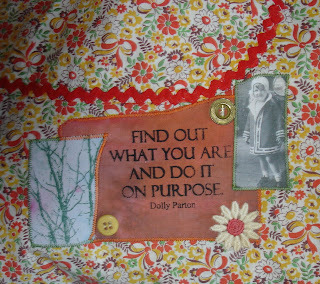 Then I rummage through my stash of images and words, looking for something that "rhymes," that makes the apron sing. 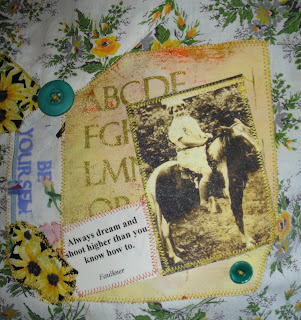 I applique words and quotations. I add photos and prints. Sometimes I print directly on to the fabric. Then I stitch around all the edges, by machine or by hand, and add buttons or lace for punctuation. Women are snapping them up at my shows. "I'm going to wear this to work!" one laughed. Many tell me about their own memories of Mom and her aprons. I love the feeling of connection from one generation to the next. Dolly Parton is awesome! Great quote!